Step away from the flip-flops! 1. Braided details in a variety of colors that'll make you feel like you're getting away with something because they're so dang comfy. Get them from Amazon for $24.95+ (20 colors, sizes 5–11). 2. Midi heels with a gorgeous design to put a lil' more pep in your step without stepping outside the office dress code. Get them from Amazon for $17.99+ (18 colors, sizes 5–11). 3. Floral kitten heels even people with a cat allergy (real or faux) may want to adopt. Get them from Express for $55.93 (down from $79.90, sizes sizes 6–10). 4. Ankle straps for some flexible style on those days when you just have to book a conference room and sit in a corner get some work done. Get them from Amazon for $17.99+ (17 colors, sizes 5–11). 5. Buckled beauts that'll give a fresh spin to that LBD you wear to work once a week. A good dress is a good dress, OK?! Get them from Topshop for $68 (five colors, regular or wide-fit sizes 4.5–11.5). 6. Strappy neutrals built for serving casual Friday maxi dress lewks. Get them from American Eagle for $14.97 (down from $29.95, sizes 5–11). 7. Sunny wedges slight enough to easily maneuver in a stampede to the break room next time there's leftovers from a catered meeting. Get them from H&M for $24.99 (sizes 4.5–10). 8. Boho darlings that don't look too earthy to wear to the office. Get them from Walmart for $12.44 (sizes 6–10). 9. Safari prints for a ride on the wild side while working your way through a stack of pressing emails. Like what Mötley Crüe sang about, but in a way that won't ruin your burgeoning career. Get them from Free People for $100 (also in zebra, Euro sizes 36–41). 10. Caged pumps made by Clarks, so you know they'll keep your old dogs from howling before the end of the work day. I have these in black and have worn them 2+ days a week to the office this summer! They're also sturdy enough to stand on a jolting subway car without falling on your fellow passengers. Get them from Amazon for $48.86+ (also in sand and tan, sizes ). 11. Chunky wedges so you won't have to do the my-feet-hurt dance in standing room meetings. Get them from H&M for $19.99 (sizes 4.5–10). 12. Studded gladiators here for you 'til you land that big promotion and finally have a Valentino budget. Get them from Missguided for $20 (three colors, sizes 5–10). 13. Low-key flats in a nice-looking faux-leather that'll become your lazy day go-tos. Get them from Amazon for $19.99+ (26 colors, sizes 6–11). 14. Woven flats begging to be worn with all your breezy office-approp summer pants. 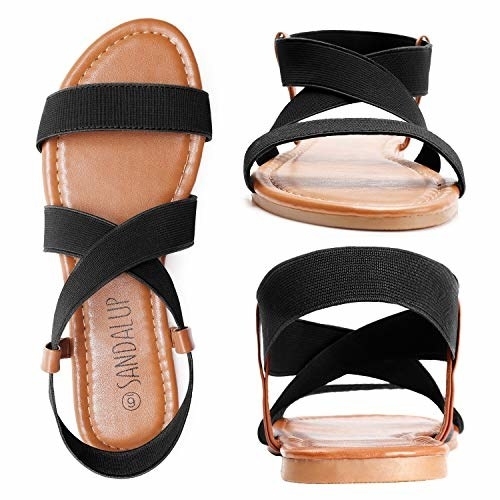 Get them from Free People for $78 (also in tan, Euro sizes 36–41). 15. Bold heels with enough chunk to keep you from eating it in front of your whole department. Get them from Amazon for $22.19+ (14 colors, sizes 6.5–10). 16. Cork beauts as a constant reminder that it's almost wine o'clock. Get them from Anthropologie for $168 (sizes 6–10). 17. ~Wild~ slides that'll be all business in the front, party in the back like the mullet HR (rudely) suggested you cut. Get them from Nordstrom for $59.96 (sizes 5–9). 18. Gothy lace-ups ready to help you maintain your personal brand. I own these and practically drown in compliments when I wear them. Get them from Public Desire for $44.99 (four colors, sizes 5–10) or from Asos for $42 (yellow only, sizes 5–10). Also available in a slightly higher heel. 19. Vibrant mules so cool, you'll distract your work nemesis who always tries to one up you. MUHAHAHAHAHAHA. Get them from Topshop for $48 (three colors, sizes 4.5–10.5). 20. Embellished flats — they may feel slightly fancier than your leather flip-flops, but they're just as comfy! Get them from Missguided for $42 (also in black, sizes 5, 6, 8–10). 21. Perforated booties as a viable, sturdy option for folks who detest sandals, but can't wear their proper boots in sizzling temps. Get them from Express for $59.90 (also in tan, sizes 6–10). 22. Simple heels with enough pizzazz that people may start an office rumor that you got a raise. Get them from Amazon for $19.45+ (six colors, sizes 5–10). 23. Casual flats for an easy look that'll keep things just interesting enough for your cubicle. Get them from Forever 21 for $22 (also in tan, sizes 5.5–10). 24. Dainty studs with handsome scallops to make these heeled sandals rise above the rest. Get them from Anthropologie for $88 (also in blush, sizes 6–10). 25. Metallic stunners — they'll help you prove to HR that silver meshes well with the dress code. Get them from Urban Outfitters for $9.99 (down from $39, sizes 6–10). 26. Spotted choices that can totally act as neutral accents to any of your breezy summer ensembles. Get them from Zappos for $32.99 (four color combos, sizes 5.5–10). 27. Espadrille twins in pretty neutrals to keep you well-heeled (minus the heels) for the season. Get them from Asos for $29 (includes both pairs of shoes, sizes 4–12). 28. Stiletto pumps with a serious vintage feel that'll look dangerously profesh with your pencil skirts. Get them from Unique Vintage for $58 (sizes 6–10). 29. Minimalist T-straps here for a pastel pop in dreary times of need. Get them from ModCloth for $65 (sizes Euro sizes 36–41). 30. Elastic flats more than 1k reviewers love on Amazon and you'll totally *get it* once you've worn a pair for a day. Promising review: "I love these shoes. I got them in three colors and have gotten two each of navy and black as backups — proof enough of how great they are?? So basic, simple, and inexpensive, but they feel great and I get a lot of compliments on them. I stand a lot at work and these are very flat, but don't wear me out, surprisingly without a lot of cushion. I prefer to feel almost like I am not wearing shoes, so these are perfect! Did I mention I love these?" —Jill O. Get them from Amazon for $16.99+ (six colors, sizes 5–11). 31. Ringed Torys as a classic option (with a twist!) for when you can't muster the strength to put your toes in shoe jail. Get them from Zappos for $248 (four colors, sizes 6–10). 32. Colorblocked gems that come in three alluring color combos so you may just have to buy all of them. Get them from Anthropologie for $148 (also in black and purple, Euro sizes 36–41). 33. Cutout wedges with just enough edge so you don't have to fully embrace the man's idea of footwear. Or just wear them because they're cute?! Get them from Walmart for $19.88 (sizes 6–11). 34. Studded espadrilles for the perfect marriage of tough and sweet, like your office persona. Get them from Public Desire for $39.99 (also in white and black, sizes 5—10). 35. Luxe T-straps with minimalist metallic details to keep it dressy enough. Get them from Nordstrom for $108.95 (four colors, sizes 5–11).